Three Dots and a Dash opened a year ago and wowed us with its Caribbean theme. 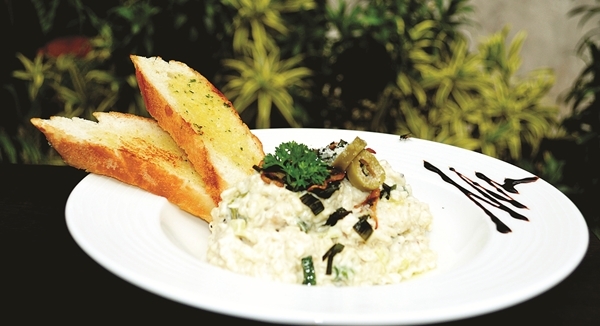 Now, Executive Chef K Dinakaran is taking the restaurant one step further with new additions to their list of drinks and dishes. Their cocktail menu, which is the speciality of the bar, has some fun additions. The Tiki Tower is a concoction of gold and Caribbean rum with a blast of fresh melon flavours. For ginger beer lovers, we recommend Dark and Stormy, which also has black rum and lime juice. We tried Robai??i? ?s Mistake, a heady blend of light rum and London gin. Served in a tall Tiki glass, a dash of passion fruit purAi? ?e makes it summery and light. If you want some theatrics in your drink, go for the Fog Cutter ai??i?? gold rum, bourbon and gin along with some fruity flavours. 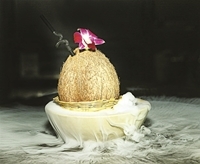 The drink is served in a coconut shell on a bed of liquid nitrogen, one for your Instagram page, we say. ai?? ?We have added several new options to our appetisers section. We have also included more vegetarian options,ai??? says the chef. The California spuds are loaded baked potatoes, but with no hint of oil which make it light. The Stuffed mushrooms deserve a special mention for their crunchy Panko-coated crust. One of the highlights is the Hawaiian Tuna poke bowl. Although the traditional dish is made with raw fish, the chef tells us that his version, made with pan-seared blue fin tuna goes well with the drinks. The Lamb Puff Pie has slow-braised chunks of lamb and is served with potato mash and veggies. The crispy texture of the pastry makes the dish a hit. The chef has catered to those who are trying to eat healthier, so the pizza base here is made with whole wheat. The Saffron, Mushroom and Leek Risotto is pure comfort food ai??i?? great for a chilly day. We finished with a sinful and dark Baileyai??i? ?s raspberry gateaux, a must-try in our books.